By entering into this Agreement, you acknowledge that ‘PokerStars Live’, ‘PSLive’, 'EPT', 'APPT', 'BSOP', 'PCA', 'PSPC', ‘PokerStars MEGASTACK’ and ‘PokerStars’ are brands owned and operated by a group of companies known as "The Stars Group”. Where used, the term “Group” shall mean, as may be applicable depending on the location where the Tournament is held for an Event in which you participate, Global Poker Tours Limited (“GPTL”) or Rational Live Events (Malta) Limited (“Rational Malta”) or Rational Live Events Macau Limited (“Rational Macau”) or TSG Interactive US Services Limited (“TSG Interactive US”) (collectively the “Event Company” “we”, “our” or “us”) or a subsidiary of the Event Company, the holding company of the Event Company and any subsidiary of any such holding company. Prior to your participation in any Event, you may be required to agree to and be bound by separate terms and conditions of the casino venue who act as the licence holder and operator of the Event (“Casino Venue Terms and Conditions”). Details of the Casino Venue Terms and Conditions will be supplied by or available through the casino venue. Please note that this Agreement: (a) is a legally binding agreement between you and each applicable Event Company; (b) constitutes our entire understanding with you with respect to your participation in our Events and/or use of the PSLive system (as defined below), where applicable; and (c) supersedes any prior agreements between you and the applicable Event Company or any other member of the Group, in connection with the subject matter hereof. You hereby represent that you have not relied on any representation or assurances, whether written or oral made by us other than those expressly set forth in this Agreement. You acknowledge that we have the right to freely assign our rights, licenses and/or obligations, in whole or in part, under this Agreement to any member of our Group or to any other third party without notice to you. You should note that we (or an authorised third party acting on our behalf) shall have the right, in our sole discretion, to take all such action as we deem reasonable in order to enforce the terms and conditions of this Agreement at all times. (b) via our PSLive online registration system (“PSLive System”) at those Events where the PSLive system is available. At Events where the PSLive System is used and available, you will receive (or be instructed to download) a registration card when you register for the first time (“PSLive Card”). If your signature is not captured or provided on your registration form but you participate in the Event following registration nonetheless, this will be considered acceptance of the terms of this Agreement and you hereby agree to abide by all of the terms contained herein. By using the PSLive System to register for a Tournament (as applicable), you will need to provide us with certain personal details about yourself for the purpose of registering with and opening an account on the PSLive System (“PSLive Account”). You acknowledge and warrant and undertake to ensure that your personal information relating to your PSLive Account will be correct and up to date at all times. (a) you will need your PSLive Card in order to register into a Tournament, unless you are registering for the first time in which case you will receive a new PSLive Card upon registration as indicated in Clause 2 above. (b)following registration for a Tournament, your allocated Tournament entry ticket will be reserved by us for you until the start of the Tournament and/or your collection of your entry ticket whereupon the buy-in amount for the Tournament will be deducted from your PSLive Account. (c)if you win a prize amount in a Tournament, you will be asked for your PSLive Card which will be swiped so that the appropriate prize amount can be allocated to you and collected at the venue where the Event is being held. You will be issued with a receipt indicating which Tournament you participated in together with your ranking in that Tournament, and the prize money that you have won. (cc) a short message requesting the cancellation of your reservation for the Tournament. Please note, your cancellation message must be sent from the email registered on or with your PSLive Account. (ii) in person at the registration desk within the Event venue. Please note that as your buy-in amount will be included in the Tournament prize pool, once a Tournament begins, you will not be permitted to cancel your reservation for that Tournament nor will you will be refunded the Tournament buy in amount should you fail to participate in the Tournament. You are only permitted to have one PSLive Account which may be accessed through the use of a combination of either a unique PSLive nickname ("Nickname") or your unique PSLive Card Number and a unique and secret password ("Password"). It is a requirement of this Agreement that you choose your own Nickname and Password and you will not share it with anyone. Collectively, your Nickname and Password shall be known hereunder as your "Login Credentials". You must keep your Login Credentials secret and confidential at all times and to take all efforts to protect the secrecy and confidentiality of the same. Any unauthorized use of your Login Credentials shall be your sole responsibility including but not limited to any transactions carried out via your PSLive Account using your Login Credentials. You hereby confirm that you will not disclose your Login Credentials to any person whatsoever nor will you permit another person to use your PSLive Account for any reason. We reserve the right to run identity checks (or engage third parties acting on our behalf to carry out such checks) on any PSLive Account holder with third party credit reference agencies or services, using the information provided by you to us. (c)have engaged in any abusive, offensive, disreputable, or violent behaviour, act or omission, or supplied false or misleading information either in relation to your acceptance, receipt or use of any PSLive Assets, attendance at any Event or participation in any Tournament. The PSLive Card (together with all information contained therein) is not transferable, cannot be copied and may only be used by you for the purposes expressly permitted by us hereunder. We disclaim any and all warranties, expressed or implied, in connection with your access to and use of the PSLive Assets which are provided to you "AS IS". To the extent permitted by applicable law, no warranty or representation whatsoever is given regarding the quality, or fitness for purpose or freedom from defects of the PSLive Assets or that any information hereunder is complete and accurate. We reserve the right to suspend, discontinue, modify, remove or add to any element of the PSLive Assets in our absolute discretion with immediate effect and without an obligation to provide you with notice. The use and safekeeping of the PSLive Card (including any passwords or other security measures relating to the same) remains your responsibility once it has been registered and allocated to you. We will not be held liable for any loss nor damage suffered by you or a third party arising from your failure to safeguard the PSLive Card. You hereby acknowledge and agree that you are not permitted to be sponsored (either directly or indirectly) into any Event by a third party that is an Unauthorised Operator (as defined below), in relation to our Events nor are you entitled to wear the branded logos of any Unauthorised Operator. If we determine, in our sole discretion, that you have been sponsored into an Event by an Unauthorised Operator and/or you are wearing a branded logo or logos of an Unauthorised Operator, we are entitled to require that you immediately remove the branded logos and/or to disqualify you from the Event should you fail to do so (or we can instruct the venue and/or the Tournament Director at an Event to give effect to our determination). Subject to applicable law, you hereby waive any rights or claims you may otherwise have against us in relation to our action against you in this regard. An "Unauthorised Operator" shall mean a third party (including, but not limited to online and offline poker operators, poker rooms, sports betting, casino and fantasy sports operators) that conducts tournaments or special offers which award a free buy-in, registration or packages to or for an Event without authorisation from us. No player will be permitted to wear at any Event any logo or branding of: (i) any gaming operator which is not permitted to legally advertise according to local laws; or (ii) any other logo, picture or message which, in the reasonable opinion, may cause offence, is insensitive or may cause agitation on political, moral or other ethical grounds or is deliberately provocative in nature. (b)One upper shirt sleeve logo no larger than 70 square cm. No logos or branding on any part of the player's clothing or body will be permitted during an Event other than logos or branding which comply with all applicable provisions as set out hereunder. In jurisdictions where local regulations apply governing the display of logos and branding on players (including but not limited to symbols, trademarks and websites), all players agree to be subject to and comply fully with said regulations. Players will be allowed to wear more than one logo at an Event as long as all logos are either approved by us as headline sponsor logos such as “PokerStars” or belong to any one of our affiliated Group companies (e.g. “Full Tilt”). You agree to abide by the rules of any promotional event organised at the Event by us or an entity within our Group including any requirements to wear a specific logo(s) throughout such promotional event. Players who are sponsored on a full-time basis by a legitimate third party online gaming site (a “Sponsored Player”) must seek our written approval prior to the beginning of the Tournament to wear the logo of their sponsor and must ensure that the logo and branding of their sponsor is worn at the beginning of any Tournament. Any Sponsored Player who does not wear their sponsor’s logo and branding from the beginning of a Tournament and then tries to subsequently wear the logo at a later stage of any Tournament will need to provide written proof of their sponsored affiliation prior to such player being permitted to wear the logo and branding in question. For the avoidance of doubt the “beginning” of a Tournament shall be defined as the moment all players are first dealt their hole cards ("shuffle up and deal") on the first day of said Tournament. All players who choose to wear the branded logo of an approved gaming operator during the Tournament must abide by any restrictions or requirements as set out hereunder. No more than 10% of the overall entry field at any Tournament can wear the branding/logos of any single company with the exception of PokerStars and Full Tilt. If more than 10% of the Players in any Tournament wish to appear with the branding/logos of any single company other than PokerStars and Full Tilt, then the Players themselves must decide which Players will continue to wear the branded clothing in adherence to this rule. If no decision is made (or there is a delay in making such a decision within a reasonable time), we will hold a “high card” draw for the affected Players to make a decision. We reserve the right to photograph, televise, webcast, record or exhibit any part of any Event at any time and you hereby acknowledge our right to use your Contribution (as defined in Clause 33 below) in this way. Pursuant to this requirement to exhibit any part of the Event, Players may be asked to sit at a poker table which has been created for the purpose of televising or webcasting the Event (herein referred to as a “TV Table”). No more than 2 (two) players on the TV Table of a Tournament can wear the logo(s) of any single company with the exception of PokerStars and Full Tilt. If more than 2 players from any single company are at the TV Table then the players themselves must decide which 2 players will continue to wear the branded clothing during the Event in question. If no decision is made, we will "high card" the affected players to make a decision. Any decision made by us will be final. Any player starting the final table wearing no logos must remain as such throughout the Tournament. We (including third parties acting on our behalf) will have absolute discretion to approve the clothing and apparel worn by the players during the Event. We will also have the right to remove any logo(s), image(s) or word(s) on players' clothing and apparel, which in our opinion (or the opinion of an authorised third party acting on our behalf) contravenes the requirements of the commissioning broadcaster, applicable laws and codes of practice or rules of any regulatory body. (c)baseball caps and card protectors with logos will be allowed only if the logos on such apparel and/or items are not visible. No forms of company names and/or brand logo(s) other than as approved in accordance with this Agreement will be permitted on the TV Tables and during any form of filming including, but not limited to, sports and fashion brands. Any player wearing clothing or in possession of items (e.g. card protectors) in violation of this rule will not be able to participate at a TV Table until said article of clothing and/or item is replaced and/or removed. We reserve the right to remove (in our absolute discretion) or alter or disguise player sponsor logos if said logos do not comply with local regulations, broadcast standards or the terms set out in this Agreement. You acknowledge and agree that if you are chosen to play at a TV Table during any Tournament, you may be required to surrender any and all electronic devices including but not limited to tablets and headphones (whether they have a messaging or communication capability or not) to an appointed Tournament representative prior to taking your seat before play begins. In the event of such requirement, any player found in violation of this rule may be disqualified from the Tournament and all such player’s monies accrued up to the time of disqualification, and such player's Main Tournament buy-in, will be forfeited at our sole discretion or that of any third party acting on our behalf. There is a no-smoking policy that applies to all participants on the TV Table and this includes the prohibition of e-cigarettes. During all broadcasts and live recordings you acknowledge and agree that players at TV Tables are not allowed to communicate with, approach, or in any way make contact with any person outside of the table, including, without limitation, any audience members and appointed TV production and webcast representatives, unless such communication is related to technical issues with the filming or unless you are no longer active in the hand (i.e. where you have folded or are "all in") and subject always to our absolute discretion (or the discretion of a third party acting on our behalf), throughout the duration of the TV Table, and that any player found in violation of this rule will be subject to restrictions and/or penalties as detailed in this Agreement. During all broadcasts or live recordings of play, you acknowledge and agree that, if so requested by us, all players must remain within pre-designated locations whilst on all breaks in play throughout the duration of the TV Table, and that in such event, the players will not be allowed to leave these locations, at any point, without being accompanied by an appointed Tournament representative. You further acknowledge and agree that players might be required to show their hole cards to the hole card cameras on the TV Table on each hand they are dealt, unless the player has declared that they are playing the hand ‘blind’. We shall have the right to halt play, within reason, on the TV Table until all hole cards are displayed by all players in play. There will be a minimum delay during live broadcasts of 30 minutes where hole cards are being shown. You acknowledge and agree that we shall have the right (at our absolute discretion) to stop or delay play on the TV Table at any time, and that players are required to grant us the right to add cancel or amend breaks in play as and when reasonably required. You further acknowledge and agree that profanity, violent behaviour or other forms of misconduct will not be permitted at the TV Table any time during the Event, including, without limitation, verbal expressions, gestures or any other known form of anti-social behaviour likely to cause offence, ridicule or denigrate another individual, and that any player violating the foregoing rule may be subject to penalties as set forth hereunder as well as the Tournament Rules. You acknowledge and agree that if you are chosen to play at the TV Table, you may be reasonably required to attend such other locations on such dates as may be disclosed to you for extra filming and interviews and additional (re)takes, before play, after or during breaks and you will cooperate with all such requests accordingly. Rational Intellectual Holdings Limited (“RIHL”) which is the intellectual property rights holding company for the Group, is the sole holder of all rights in and to the PokerStars Live Assets including copyright, trade secrets, Intellectual Property Rights (defined above) and other rights. The term "PSLive" and “PokerStars Live” and the domain names “pslive.com” and “pokerstarslive.com” are the trademarks, service marks, signs, trade names and/or domain names of RIHL, and RIHL reserves all rights to the same. You irrevocably grant us and third parties acting on our behalf, all rights, consents and licenses necessary to enable us make the fullest use (including, without limitation, to reproduce, distribute, amend, edit, translate, alter, publicly display, transmit on TV, via Internet and through any other means of communication and make derivative works thereof) of your photograph, likeness, appearance, image, voice, name, film footage and sound recordings that feature you, as photographed, recorded, or broadcasted by us or on our behalf (the "Contribution") throughout the world in perpetuity and royalty-free by any and all means in any and all media, whether now known or hereinafter developed or devised, in any programme for which your Contribution has been recorded and any other programmes and any other content including, without limitation, in relation to the live or pre-recorded streaming of our coverage of a Tournament on the Internet, the production and distribution of video blogs of a Tournament on the Internet and the production and release of promos of, or other marketing materials related to, a Tournament, or poker tournaments or online poker websites associated with our brands (including but not limited to the “PokerStars Live”, "PokerStars”, "PokerStars Casino”, "Full Tilt" and "BetStars" brands). You hereby release us and our permitted designees from and against any claim, damage, liability, cost and expense arising from any violation of any right to privacy, publicity or personality that you have, or infringement of any copyright or other proprietary right that you own or hold, based upon or related to any use of the Contribution under the licenses and rights granted herein. The foregoing release shall be binding upon you and your heirs, assigns and legal representatives. You acknowledge and agree that we solely own all right, title and interest, including, without limitation, all Intellectual Property Rights, in and to the Contribution and any derivative works thereof. To the extent ownership of the Contribution does not automatically vest in us you hereby grant and assign to us (or such third party as we may nominate) all right, title and interest in and to the Contribution and agree to execute all documents reasonably requested by us to effectuate the foregoing. You represent and warrant to us that (a) you are fully entitled to grant the rights and licenses granted to us and our affiliates hereunder and (b) nothing in the Contribution (whether by way of inflection or gesture or otherwise) will infringe the copyright or any other right of any person, breach any contract or duty of confidence, constitute a contempt of court, be defamatory or be calculated to bring us, any broadcaster, and/or any of our brands into disrepute. All consents under the Isle of Man Copyright Act 1991 (“CA 1991”), or under similar legislation in other countries of the world in connection with your performance in any Event, and the exploitation of your performance at any Event by any means and in all media are hereby granted and assigned by you to us. Furthermore, you hereby waive all moral rights in and to your Contribution to which you are now or may at any time in the future be entitled under Part IV of the CA 1991 (and all similar rights in other jurisdictions) and agree not to institute, support, maintain or permit any action or claim to the effect that any treatment, exploitation or use of such Contribution or other materials infringes your moral rights. Indemnity: You agree to indemnify us and our assignees against all and any costs, claims, expenses and liabilities (including without limitation, legal fees and any sums paid on the advice of counsel) resulting from breach by you (or anyone acting under your authority) of any of the representations, warranties and/or undertakings on your part contained in this Agreement. Assistance: To the extent that we want you to participate in any promotional marketing or interviews with external trade press or other third parties, we will seek your written consent in advance. Amendments to Tournament rules: We reserve the right to add or amend any Tournament or Event rules, as we deem appropriate and any such changes will be notified on our site or to you, following any such amendment(s). Your continued participation in the Event following such amendment and notification shall serve as your acceptance of the same. Settlements: You acknowledge and agree that players at the final table of the Tournament are only permitted to discuss any form of settlement deal or redistribution of any remaining prize pool whilst seated at the table, and that an appointed Tournament representative must be present during any discussions and subsequent decisions related to prize pool redistribution will be made public. There may be buy-in and payout restrictions that apply to certain Events. Please contact PokerStars Live for details. Right to cancel: We, together with the organising casino in which the Event will be held, reserve the right to cancel or alter any Event or Tournament at our sole and absolute discretion. Observation of rules: You agree to abide by the Tournament Poker Rules and cash game poker rules. In certain circumstances these rules can be superseded by house rules or local gaming regulations. Any changes to the rules will be posted on the Event website and announced to the players during the Event. Refusal of entry: We reserve the right to refuse any person entry into any and all Tournaments as well as the Event area(s) for any reason. Individuals who are excluded by the Tournament sponsor, partner or venue are not eligible for entry into any Tournaments or Events area(s). Eligibility to play: Employees of any companies within our Group or any person or entity (including the corporate affiliates of such entity) which provide services in respect of the Event and Immediate Family (as defined below) members of such employees are not eligible to play in any Events, unless approved in advance by us. “Immediate Family” is defined as: spouse, children and any relative of an employee or other person residing in the employee's place of residence. No-transfers: Prizes and entries are non-transferable. Winners are responsible for payment of any and all taxes, licenses, registrations and other fees associated with Tournament prizes. If prizes are being paid through wire transfer, players will be required to provide identification documentation to comply with international anti-money laundering regulations. Disqualification: We, together with the organising casino in which the Event will be held, reserve the right to disqualify any person from all Tournaments and/or to request the removal of such persons the Event area(s) for any reason. If you are disqualified from a Tournament, you shall forfeit your entire buy-in and shall not be entitled to any Tournament prize monies or any other prize consideration that you may have qualified for at the point of disqualification. Force Majeure: We shall not be liable for any delay or failure in performing our obligations to you under this Agreement or elsewhere including (but not limited to) any obligation to offer a guaranteed prize pool, in the event of acts, events, omissions or accidents beyond our reasonable control including (but not limited to) acts of God, fire, explosion, accidental damage, flood, earthquake, adverse weather conditions or other natural disaster, war, threat of or preparation for war, terrorist attack, civil war, civil commotion or riots and voluntary or mandatory compliance with any law (including a failure to grant any licence or consent needed or any change in the law or interpretation of the law). Amendments: We reserve the right to change the terms of this Agreement at any time; therefore, you should review the most updated version each time prior to your participation in any Tournament. Limitation of liability: You agree that other than as required by applicable law, we shall not be liable to you for any losses, damages, claims or other expenses arising from this Agreement. Taxes: You agree that you are solely responsible for the payment (on time) of any income or similar taxes or related payments imposed or levied by any applicable jurisdiction or any governmental authority therein or thereof on any prizes, fees or other amounts paid to you, and you indemnify us and shall keep us fully and effectually indemnified from and against any liability or expense in connection with such taxes or other payments (save to the extent such recovery is prohibited by law). You agree that you are fully responsible for submitting to the relevant Tax Authority any tax return/s in respect of any payments received by you (prizes and fees) and that you will ensure that such tax returns are submitted accurately and on time. Governing law: The terms of this Agreement shall be governed by and construed in accordance with the laws of the Isle of Man. You agree that any dispute concerning or arising out of this Agreement will be decided by the Isle of Man courts. 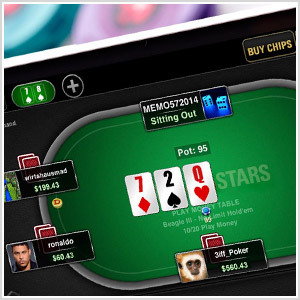 Nothing in this Clause shall limit the right of PokerStars Live and its affiliates to take proceedings against you in any other court of competent jurisdiction, nor shall the taking of proceedings in any one or more jurisdictions preclude the taking of proceedings in any other jurisdictions, whether concurrently or not, to the extent permitted by the law of such other jurisdiction. Official Language: With respect to Events held in New Jersey by TSG Interactive US, the English-only rule will be enforced at all tables during play. Participants who violate this rule will be subject to penalty, including disqualification. These Terms and Conditions were last updated on November 29, 2018. Version: 20181129.